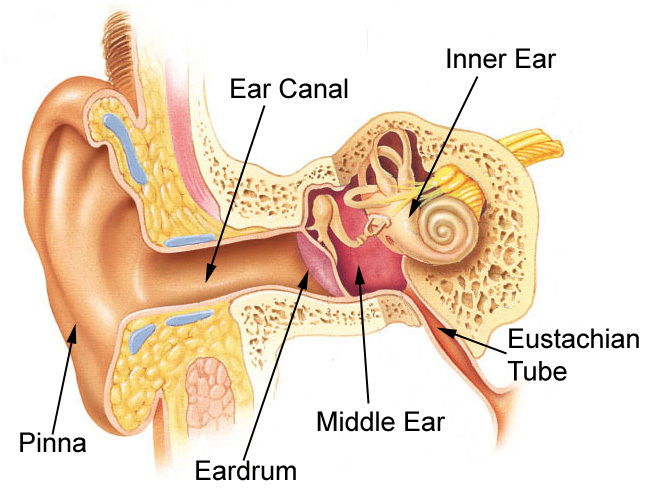 There’re several parts and components of ear, which are divided into the outer, middle and inner ear sections. Each part is essential to the overall function of it. The ear parts allow the body to capture sound waves out of the air, translate them into vibrations and send these signals to the brain to be interpreted. If any portion of this system is harmed, it can be difficult to hear, or the patient can lose hearing in that ear all together. Understanding the inner workings of your ear can help you understand what you need to do to encourage optimum ear health and safety. The ear plays an influential part in the sensory system. This organ is a key portion of the auditory system, which translates sound waves into a signal that the brain can interpret. In addition to helping the body take in auditory messages, the ear helps to maintain a proper head position. The fluid in the ear also helps the body maintain a sense of balance so the body can maintain proper posture and coordination. There are three major parts of the ear, the outer, middle and inner ear. Each contains several parts that are essential to the overall function of the ear. The outer ear is the portion of the ear that sits atop the skull, which is made of flesh and cartilage. It is the visible part which serves to protect the eardrum. It also collects and guides sound waves into the middle ear. The ear flap or pinna is the outer portion of the ear. This is the physical portion of the ear that you see on the side of your head, which is used like a satellite dish to collect sound and transmit it inward where it can be translated into the appropriate medium. This part of ear extends inward from the outer ear. This 2 cm canal helps to amplify sound as it enters the middle ear so it can be interpreted properly. This area also contains cells which produce ear wax, which helps keep debris out of the middle ear. The middle ear contains tissue and bone but no skin, and is the area where sound is translated into mechanical energy so it can pass through the body. Most diseases such as ear infections will take hold in the middle ear, though some can also affect the inner ear. It translates sound waves from the outer ear into the form of pressure waves. The eardrum, known scientifically as the tympanic membrane Is a thin piece of tissue that is stretched between the outer and middle ear. It is called the drum because sound waves will hit it and cause it to vibrate, which will take the sound from acting as wave energy and translate it to mechanical energy that can travel through the rest of the ear. The malleus or hammer of the ear is one of the smallest bones in the body. It is connected to the ear drum, and will vibrate as the drum is hit by the sound waves, passing the sound on to the rest of the ear. The anvil bone or the incus sits on top of the hammer, and will collect the vibrations coming from the ear drum, sending them on to the stirrup. The stirrup or stapes sits below the anvil, and is the final bone in the inner ear to collect and pass on sound. These sound waves will cause the stirrup to compress, compressing the waves so they can be passed on to the inner ear. The inner ear is the part of the ear which is responsible for translating the message and sending it to the brain where it can be interpreted. It is filled with fluid that helps to balance the ear organs and comprise the hearing so it can be passed to the nerves. This is a spiral tube that is covered in a stiff membrane. This membrane is filled with nerve cells, commonly known as ear hairs. These â€œhairsâ€ are each designed to pick up on a different type of vibration, which hits in different frequencies. As the nerves begin to vibrate they will turn these frequencies into an electrical pulse which will be sent up to the brain. If the ear is exposed to sound that is too high pitched or too loud, these hair-like nerves can break off, and they will not grow back. This is one of the biggest contributors to hearing loss. These nerves receive the electrical impulses generated by the ear and pass this information up to the brain so it can be interpreted. These are attached to the cochlea, but do not spend much time interacting with the hearing portion of ear function. Instead, these fluid filled tubes will turn and sway with movement, helping you keep your balance.